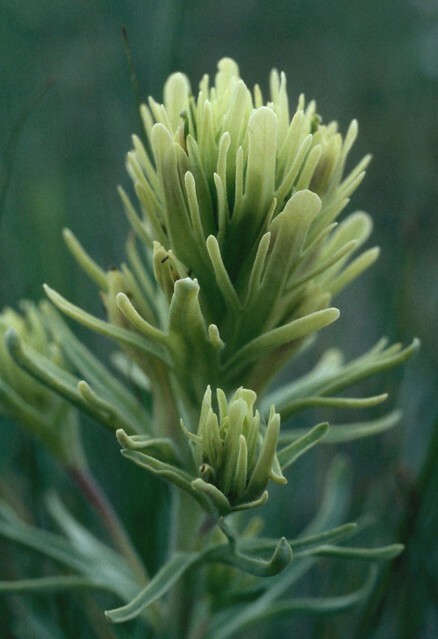 Thompson’s Indian paintbrush is not a colorful plant, unlike other paintbrushes. The yellow to green “flowers” are actually modified leaves hiding the inconspicuous tubular flowers. The petals fuse into a narrow, elongate tube. The stems are in clusters and usually grow four to sixteen inches tall. Short white hairs cover the stems and leaves. Paintbrush is able to take water and organic material from a host plant’s root system, thus obtaining more water and nutrients than it could obtain by itself in dry conditions.